Bob Evans | 3000 Clark Ln. Cracker Barrel | 3304 Clark Ln. Golden Corral | 3421 Clark Ln. Truman’s | 3304 W. Broadway Business Park Ct.
“Who’s in Columbia?” my co-worker Aubrey asked. It was a valid question. I’d just told her where Evan and I were spending the weekend. Many people travel to visit the two customary “f’s”—friends and family. But for my husband and I, there’s a third “f” worth traveling for. The reason we were driving to the heart of the Show-Me State? Food. “Is this a park or a brewery?” Evan asked, more in amusement than confusion. “It’s both,” I answered. Logboat Brewing Company was our first stop in Columbia. A grassy sea of green surrounded the industrial building housing the brewing facilities and taproom. The outside picnic tables were full of patrons nursing their frothy pints. It was sweater weather so blankets and lawn chairs accommodated the rest of the crowd playing corn hole and bocce ball or standing in line at the food truck. It wasn’t a festival. It was just another day at Logboat Park—aptly named for its centerpiece, a wooden carved canoe. Inside, the wood craftsmanship struck us as much as the earthy aroma of hops. Reclaimed Missouri heart pine made up the exposed beams, table tops and wraparound bar where the bartender gave us a condensed version of the brewery’s history. Behind her, a glass wall provided a peek into the beer-making process. The ginger wheat brews she poured into our glasses had logged many hours in those stainless-steel cylinders. “You can find our brews in many local restaurants like Flyover,” the bartender said when we settled our tab and prepared to find food. She mentioned that Flyover—a tongue-in-cheek reference to what many people mistake states like Missouri for—boasted a wood-fired stone oven. We already had dinner plans, but I decided it might be a good après-supper stop after learning the kitchen was open until midnight. Evan and I were no strangers to progressive dinners. An hour and a mile later, we were seated at the bar belonging to Barred Owl Butcher & Table. At least five shelves high and reachable by a sliding ladder on a track, it was pretty much a library of libations. But we weren’t at Barred Owl for its craft cocktails. Like Logboat, the establishment had a glass partition providing a behind-the-scenes look at its menu. In this case, it was carcasses artfully hanging from hooks. Our waiter set down a thick wooden cutting board piled high with paper-thin slices of salchicon, salami Calabrese, ham hock terrine and Evan’s favorite—bresaola. “It’s an epicurean adult Lunchable,” I noted, reaching for a piece of baguette and cheese to pair with the sustainably-sourced meat. The waiter explained how the spread came from local purveyors. Ironically, our next dish—a mix of Gaeta, Cerignola and Castelvetrano olives—came from obscure regions in Italy. “I can’t tell if this place highlights food from local farms or foreign countries,” I said. “It does both,” Evan remarked, popping an olive into his smiling mouth. “Romano, Romano, wherefore art thou Romano?” I inquired dramatically the next day at lunch. Covered in flour and smelling of garlic, we were in downtown Columbia’s most popular pizza joint: Shakespeare’s. But, instead of sitting in the dining room, devouring signature pizzas like the Darwin—a healthy pie named for Columbia’s athletic former mayor—we were creating our own concoctions in the restaurant’s kitchen. Evan had booked us a “Shakespearience”— a cooking class complete with a tour of Shakespeare’s “Secret Room” where they mix 4,000 pounds of dough per week. In fact, the package was so thorough that after eating our eight-inch pies, we got to do the dishes. Several hours of shopping later, it was time to refuel. Columbia’s downtown area—The District—has an equal shop-to-restaurant ratio, so there was certainly no shortage of dinner options. Ultimately, we succumbed to my taco craving, finding ourselves a coveted corner table at 44 Canteen. It seemed fitting we’d end the day enjoying another finger food heaped with toppings. Pickled red onion spirals, shaved cabbage, jalapeño coins and a generous dusting of Cotija adorned my chicken tacos. Local cucumber kimchi, ssamjang mayo, pickled mustard seeds and cilantro sprigs topped Evan’s caramelized Berkshire porkbelly on steamed buns—44 Canteen’s taco de jour. “A dish fit for the gods,” he replied, doing his best impersonation of Brutus. I suppose if I could start the day referencing Romeo and Juliet, he had every right to end it reciting Julius Caesar. “It’s BYOI,” our waiter at Broadway Brewery said the next morning. The bluegrass band began playing an hour ago but it was growing by the minute. Locals kept walking in carrying guitars, fiddles and banjos—ready to jam for the Sunday brunch crowd. I grabbed the celery stalk out of my Bloody Mary and played it like a harmonica. Evan laughed and used the opportunity to poach another fork-full of Missouri trout and eggs off my plate. The food at Broadway Brewery is all farm to table and many of the beers come from the in-house brewery. The entire menu needed a “Made in Columbia” sticker. The day’s next meal was a little less Columbia-esque. The neon sign looked like something you’d see on the streets of Bangkok. The food—battered frog legs and steamed pork dumplings—brought me back to our honeymoon. When Evan suggested we get a late lunch/early dinner at Bangkok Gardens, I didn’t anticipate complete authenticity. I was never so happy to be so wrong. The flavors were absolutely intoxicating. I hovered around the comforting basil end of the spectrum and Evan perched on the end resembling swallowing a blowtorch. Our waiter even commented that the chef was impressed (after the second time Evan sent his curry back to add more heat). Fittingly, the day ended with a cold beer. Located right off I-70, Bur Oak Brewing Co. was a convenient last hurrah before leaving Columbia. Normally only open on Fridays and Saturdays, we lucked out that it was open for a community event. “Our Big Tree IPA is modeled after the Columbia Bur Oak tree,” explained Craig, the brewery owner. “Its ABV is 7.6% because the tree’s diameter is 7.6 feet and its IBU is 90 because the tree is 90 feet tall.” As he guided us through the 15,000-square-foot production facility, I was also impressed with the size of the fermenters. Chalkboard signs next to each revealed which beer was inside. The tour’s biggest mystery was the source of the occasional meowing. When the black furball finally brushed past my leg and revealed himself, Craig introduced us to Clyde—the brewery’s rescue cat and the inspiration behind Clyde’s Caramel Cream Ale. I laughed. No one leaves Columbia hungry. The warm weather in Columbia is what many, like myself, anticipate all year and for a really good reason. Now that June is underway and the days are getting longer, I’m here to let you know just where you can breathe in fresh air and experience Columbia from some of my favorite spots: the patios. There are several patios to enjoy across Columbia and even more open up every year, but no two patios are the same. They each take on their own character, feeding off the energy of the staff and guests to build an atmosphere that is unique. Although not a comprehensive list, I’ve brought together some ideas of where to find just what kind of patio you’re looking for. With two locations in Columbia and two decades of experience under their belt, Tropical Liqueurs knows how to treat patrons to the ultimate patio experience. The modest patio tables have shade umbrellas to protect you from the hot summer sun while you take in a cold drink. No food is served at the locations so this is a good place to spend an hour or two with friends or colleagues after work before heading home or to dinner. Started by a female entrepreneur, Günter Hans- Artisan Café sports a traditional European flare that welcomes customers. Günter Hans is Columbia’s only full wine tap, which offers customers a unique experience coupled with a beautiful patio. The wine tap means the product arrives in barrels and is then served directly into the glass without being exposed to oxygen. European favorites such as bretzels, bratwursts, and waffles are featured on the limited menu to beat any snack craving you might have. Known for its location on Corporate Lake, Las Margaritas is a great spot for catching up with friends over delicious queso fundido or nachos Margaritas from their appetizer menu. The friendly personalities of the staff and quick service make your trip even more enjoyable and offers the potential to be a memorable meal. This pick is a newcomer to the Columbia scene and is taking strides to be a must-try for residents and visitors. While you’re there learn more about the made-from-scratch, ingredient-first culture they are so proud of. The staff from the front door to the table are friendly, passionate and ready to answer any questions. The charcuterie and spreads menu offers a variety of options, from a Butcher Board to a whipped ricotta served with pita breads that pair perfectly with good people, memorable stories, and hand-crafted drinks. 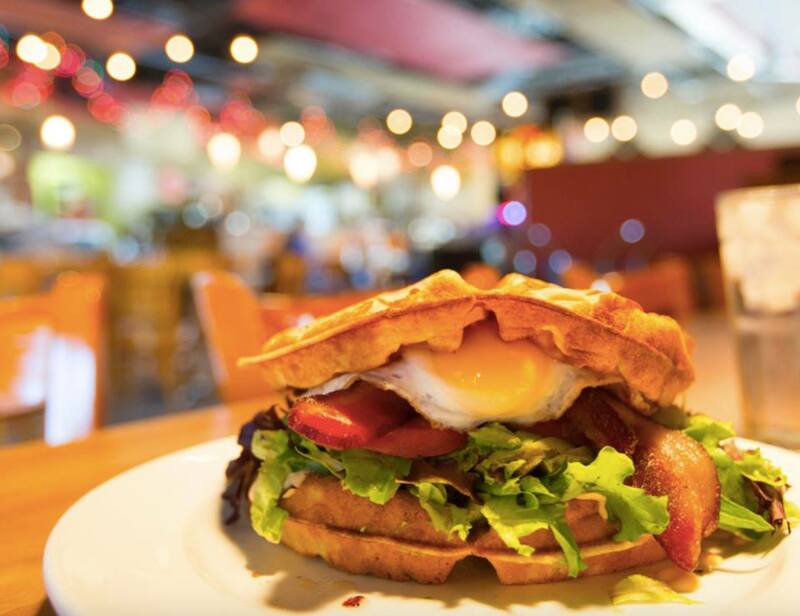 Saturday and Sunday mornings year-round are busy with excited patrons ready for locally sourced comfort food but the onset of warm weather opens up new possibilities for Cafe Berlin-lovers. The patio is a great place to enjoy warm weather during the day and into the afternoon while night is a time to support local bands playing. Cafe Berlin is known for being vegetarian-friendly and a great place to eat out if you’re looking to please a variety of food lifestyles. Although outdoor seating is limited, Tellers is a wonderful place to eat if you’re interested in watching The District’s nightlife or catch a street performer playing. Inside, if you venture in, is home to several pieces of local artwork. Each piece is unique and adds to the artistry of the atmosphere. With specialty pizzas and craft beer from its in-house brewery, a night out at Flat Branch Pub & Brewing is sure to be a special one. 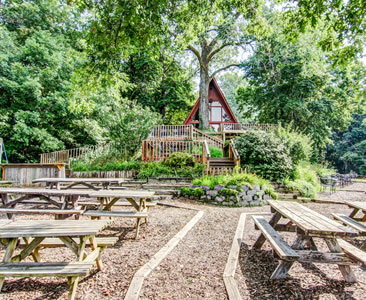 The outdoor patio is surrounded by trees so that the area is more intimate and cozy. Smiling faces from the servers and a wide variety of food options for all kinds of eaters makes this a nice location to spend time with a special someone or for a comfortable night with dear friends. Located at the top of The Broadway Hotel in The District is the perfect place for a romantic night. 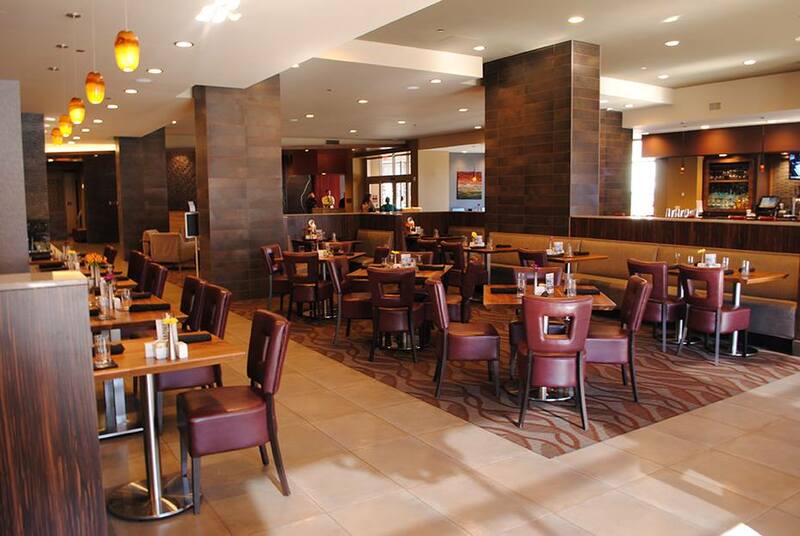 The Roof offers a beautiful view of the Columbia skyline accompanied by a lavish and diverse menu. The seating options and fire pits create a fun atmosphere to share that special somewhere. A staple for visiting parents and prospective students, this is also a must try for anyone visiting Columbia. The Heidelberg’s upper patio offers a view looking towards the University of Missouri and offers both covered and uncovered tables in case you need to get out of the hot sun. From appetizers to drinks to burgers, you’ll be sure to find a favorite to add to your list of traditions when visiting. Each Shakespeare’s location has a traditional patio where individuals (and their pups) can enjoy a slice and a cold beer. If you’re looking for something a little different, Shakespeare’s Downtown v2.0, as they call it, has a garage door to give you an indoor/outdoor feel along the side of the building for a more private eating experience. Whatever your patio needs are, Columbia has you covered (or uncovered). Try them out and share your favorite patio stories and photos with us on Instagram and Twitter. 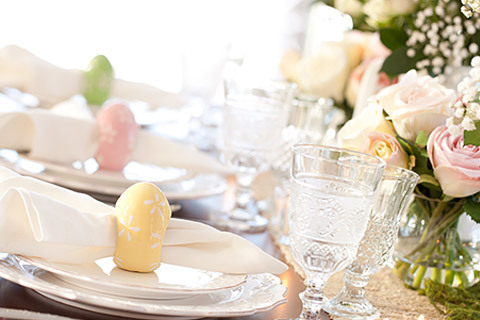 This year, treat your mom to a delicious brunch and some awesome gifts from Columbia. Locally made gifts, beautiful jewelry, cute paper products, candles, and so much more to choose from. You can find something that any mom would love at Poppy. If your mom has a green thumb, check out Strawberry Hill Farms. Pick out something you know she’ll love or head over together after brunch and offer to buy her favorite. So many chocolatey options! Even if chocolate isn’t really your mom’s favorite, there’s other candy choices, plus great candles and cute home accessories. Take mom to make her own signature scent at Makes Scents. Bonus: it’s right next to Sparky’s. For the foodie mom! Purchase a gift certificate if your mom has a busy schedule, or you can pick out the best time for you to take the tour together. Does your mom love cowboy boots or clothes with a western edge? 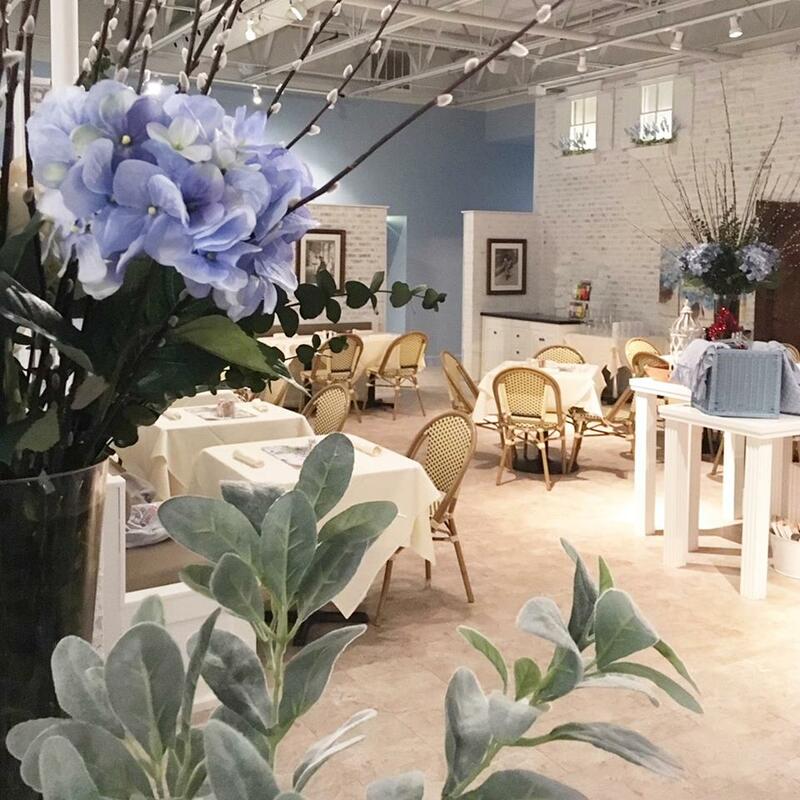 Check out this brand new boutique, owned by a local mom and daughter trio! Advanced admission tickets are available now! Go ahead and get tickets for mom AND yourself. Enjoy your time with mom! 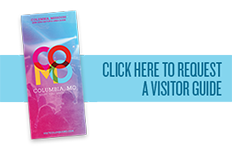 Tag your photos #ShowMeCoMo to share your experience with us. Hi, I’m Megan. I do Marketing and Communications here at Visit CoMo and I’m also a Columbia native! I love traveling, the Mizzou Tigers, live music, ice cream, my cats and a good nap. I’m also lucky enough to get to promote my hometown every day. There are so many different ways to enjoy Columbia and each month I’ll be bringing you some of my favorites. Let’s go! As a Columbia native, one of the things I’ve always loved about our city is how many diverse dining options we have here. Cuisines from all over the world are represented, and chefs are adventurous with their ingredients. They also focus on procuring items from local purveyors, which really takes CoMo’s food to the next level. When your job is promoting Columbia, trying out as many of our restaurants as possible is research, right? 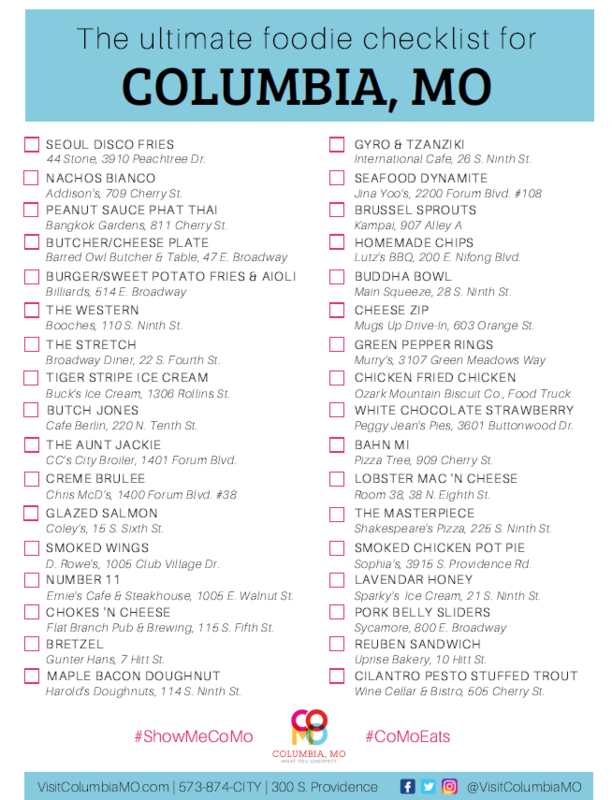 So, I’ve done my research and here are ten of my favorite CoMo bites (in no particular order). Sub Shop has been serving up sandwiches since 1975, and they’re a rainy day staple for me. Their veggie sandwich also comes with plenty of mayo and cheese and their homemade bread is toasted on the outside and soft on the inside. When it’s chilly, I have to add an order of their tomato soup. It’s thick and full of big chunks of melted cheese. And if you really want to take it up a notch…add bacon to that veggie sandwich and thank me later. Photo from IG user @taco_bout_someyummyfood. Room 38 has an incredible menu that ranges from flatbreads to steaks to small plates and an incredible brunch. But one thing I have to get every single time is an order of the Pretzel Bites. They’re hidden at the bottom of the sharing plates section, but do not overlook these nuggets of amazingness! The bites themselves are soft and salty and drenched in honey butter. As if that wasn’t enough, they come with a side of spicy cheese dip. Room 38 has a nice lounge feel and the darker lighting means no one will see you stuffing your face with these super quickly. This pool hall knows how to do food! Their burgers have won the hearts of visitors and citizens alike, but my favorite things to add on the side of my burger are the sweet potato fries. Are the fries delicious? Yes, but it’s the aioli that really makes them. Truly you could put this aioli on just about anything they serve (ahem, grilled chicken sandwich) and be happy, but the sweet crispness of the fries really goes with the aioli so well that you might as well stick with how they serve it. Photo from Sparky’s Homemade Ice Cream Facebook. Here’s the thing about the Oreo Speedwagon. I can’t promise that it will always be on the menu at Sparky’s. They always have a wonderful variety of flavors rotating in their case and you can’t go wrong, but for me the Oreo Speedwagon is where it’s at. It’s basically a cookies ‘n cream ice cream but made with coffee ice cream instead of vanilla. Such a sweet pick me up! And you can say that ice cream isn’t as good when it’s cold out, but you would be wrong. I have been going to Murry’s for as long as I can remember. In my family, you got to pick where you wanted to eat for your birthday and both of my parents always picked Murry’s. Now the entire meal was always delicious, but it was the order of the Blue Chips Cheese Bread that really got the night started. Thick slices of bread are topped with blue cheese and shrimp and then covered with another melty cheese that I’ve never been able to pin down. Then everything is toasted and melted together and it’s just perfect. Murry’s brings back so many great memories for me and those memories definitely include this appetizer. Seoul Taco started out as a food truck in St. Louis and now has a shared space with Strange Donuts right here in downtown Columbia. Whether it’s lunch time or late at night, I am in love with their Bulgogi Tacos. They’re so simple…just meat, greens, sesame seed and delicious Seoul sauce, plus a lime for some brightness, but their complex flavor is beyond. Their menu is small but the flavor is big! Photo from IG user @drewjkoch. Things I don’t like: sauerkraut, Swiss cheese, rye bread.. But somehow, when Uprise Bakery combines their house made ingredients (seriously, everything on the sandwich is made right there), it’s a dream come true. This is another rainy favorite and is perfect as a meal with a beer from the bar before seeing a movie at Ragtag, which shares a space with Uprise. I’m so glad I went outside my comfort zone and tried this sandwich. This is a more recent discovery of mine and it quickly made my top list. Coley’s is another spot downtown with a great menu, and this dish is one that won’t make you feel like you overdid it at dinner. The salmon filet is cooked perfectly and served over vegetables that are cooked but still crisp. The soy honey glaze that finishes everything off makes this one of my new go-to’s that never lets me down and keeps it light…so I can go to Sparky’s after. Photo from Kampai Alley Facebook. Kampai is tucked in Alley A in downtown and specializes in delicious sushi. But my favorite bite from Kampai is actually on their hot tasting menu. I’m a sucker for anything involving Brussels sprouts, but these are now my favorite in town. The sprouts are flash fried and then drizzled in lemon chili oil. It’s a simple dish, but the crunchy sprouts along with the spicy and bright oil are the perfect combination and a great lead up to some of their sushi. Ok, so I had to throw one salad in here! No matter what entrée I get at Sycamore, I always have their beet salad to start. The mixed greens are always super fresh and well dressed, and you can put a roasted beet on just about anything and I’m game. But then they had to go and add goat cheese and now I have to get it every time I go, which is often. I love Sycamore’s cozy atmosphere, great drinks list and fantastic service. And I love their beet salad. I can’t tell you how difficult it was to narrow down this list, so you can probably be sure that I’ll do another one at some point in the future. For now, I’d love to know what your favorite CoMo bites are…we may even share them online! I’ll be back next month with my version of a CoMo gift guide. Remember to tag us in your Columbia photos and use #ShowMeCoMo opens in a new window to share. We’ll update the list as we find out more. Happy Holidays! Hi, I’m Megan. I do Marketing and Communications here at Visit CoMo and I’m also a Columbia native! I love traveling (that’s me with a glacier in Alaska), the Mizzou Tigers, live music, ice cream, my cats and a good nap. I’m also lucky enough to get to promote my hometown every day. There are so many different ways to enjoy Columbia and each month I’ll be bringing you some of my favorites. Let’s go! Autumn in Columbia is my very favorite season. I love the crispness of the air, the leaves changing, the sound of drumlines that signal football is back. It’s also the perfect time to get out and spend time with friends. My favorite days spent out in CoMo lately are with my pal Brenna, who is the Editor over at the Columbia Business Times. We like to mix something active with a nice dose of leisure, so this fall day out is perfect! This itinerary is more of a suggestion, though Brenna and/or I have done all of these things here in Columbia. Brenna would like you to know that I promise action photos from our next day out (Winter) because we’re going to plan it now and then document our day! Ok, ready to spend a great autumn day here in CoMo? Let’s do it! First thing’s first: sleep in a bit. You thought we were going to get up at the crack of dawn for our day out? Ha! You do not know Brenna and me well enough yet. Only Café Berlin could make something called the Compost Pile mouthwatering. The District, Columbia’s downtown, is full of fun little shops to explore. We have a few favorites that we always stop by so we can see what’s new! Route used to be known as The Mustard Seed, but it’s still the incredibly unique free trade shop you always loved. The beautiful handcrafted pieces from around the world range from jewelry to scarves to décor. Last time we were in, I picked up a beautiful silver vase for my mantle at home and a black and gold ring I can wear when I want to look fancy while supporting Mizzou. Every time I walk into Poppy, I decide I probably need one of everything. Photo from Poppy’s Instagram (@poppymadebyhand). Poppy is also home to a great array of handcrafted pieces that make it very difficult to leave without something new. The fabulous owner, Liz, curates the best in jewelry, greeting cards, baby clothes, art and so much more, so that Poppy is the perfect place to shop for a gift. I’ve gotten everything from wedding shower gifts to Mother’s Day gifts at Poppy. They also partner up with Christy at The Ink Café for calligraphy classes that are a blast – even for people like me who have terrible handwriting and can only draw stick people. Yellow Dog always has the best window displays! Here’s theirs from the True/False Film Fest this year. Photo from Yellow Dog’s Instagram (@yellowdogbookshop). One place we absolutely never ever miss (ever) is Yellow Dog Bookshop. This small shop is owned by a wonderful married couple and is stuffed full of used books. They have a huge non-fiction selection on all sorts of topics, a Missouri section, and a fiction section that I love looking through to find treasures to add to my to-read list. Anyone who knows me even a little knows I cannot leave a bookstore without buying at least one book (and usually more), so Yellow Dog is my favorite downtown escape. Alright, I managed to keep myself from running out the door to go book shopping. Once our shopping has finished, it’s time to spend the afternoon outside enjoying the beautiful fall weather. Sometimes this is as simple as a walk on the MKT Trail here in Columbia, but when the fall colors are really out I love heading south of town to Rock Bridge Memorial State Park. Fun fact, Rock Bridge Memorial State Park is even more beautiful than this picture makes it look. Trail options are plentiful at the park, but my favorite is the wood-planked trail that leads you through the heart of the park. The trail allows you to take in the most impressive geological features of the park, including the actual rock bridge the park was named for, and you can also explore Connor’s Cave. The trail itself is under a mile long, but is has plenty of stairs and offshoots that allow hikers to experience the best the park has to offer. Plus, we’ve been shopping, so a lengthy hike isn’t really needed, right? Right. After a long day of shopping and outdoor adventure, a nice dinner is in order. Brenna and I both have plenty of favorites when it comes to restaurants in CoMo. One of the most difficult decisions to make when you have such a great culinary scene is where to go for dinner. Just in The District opens in a new window alone, it’s almost impossible to choose! 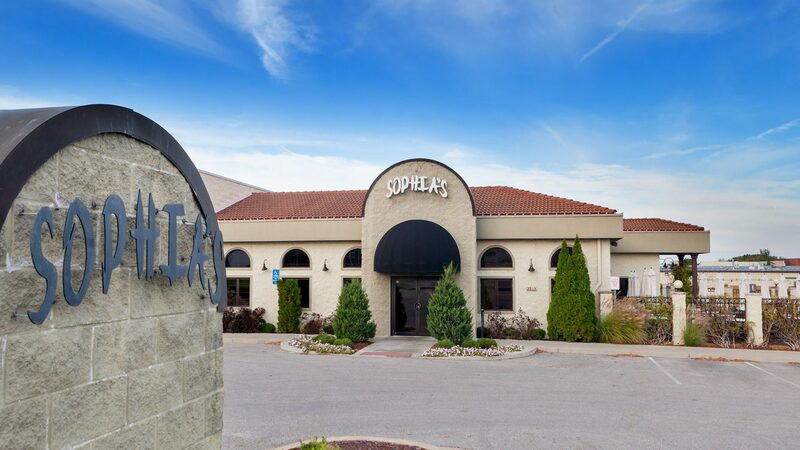 For this fall ladies’ day out, we’ll stay in the south part of town near the park and hit Sophia’s for dinner. Like most places in Columbia, the atmosphere is casual but sophisticated, and their patio is a great spot for a fall evening. The menu ranges from incredible pasta dishes to flavorful tapas and flatbreads. 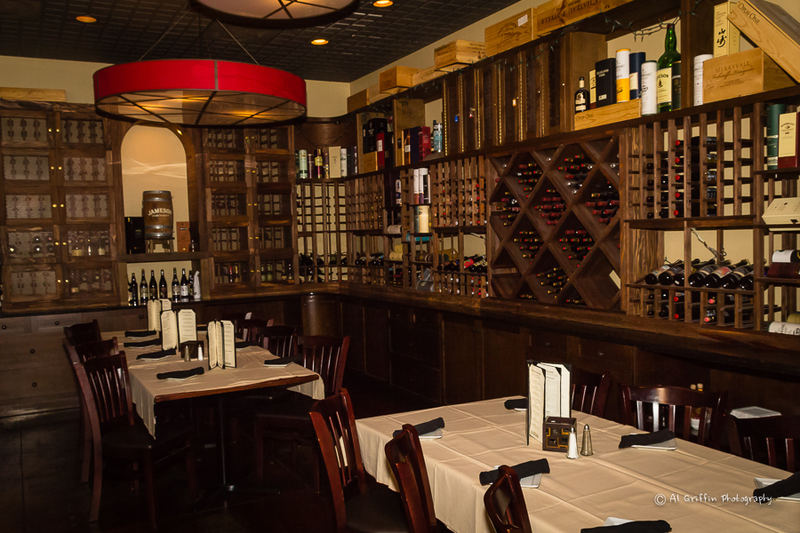 With an impressive wine list, Sophia’s is also the perfect spot to linger and make the day out last a little longer. Now for some ladies’ day out enthusiasts, there would also be another activity like dancing or cocktails somewhere fancy. But, to be honest, that’s not how Brenna and I roll. After dinner, our day ends with a big hug and a retreat to our homes where we can put on pajamas and watch Netflix. Of course, if I’ve really done a day out right, there will also be some Sparky’s Ice Cream waiting in the freezer for me. Thanks for spending a ladies’ day out with Brenna and me! We’ll be working on our next day out as the weather gets colder and bring it to you in January. Next month I’ll feature some of my favorite CoMo dishes from all over the city. See you then! Hello! 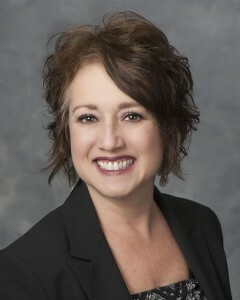 My name is Andrea and I am a sales manager for the Columbia Convention & Visitors Bureau. I am an avid traveler, and I love the experience of meeting new people, experiencing new unexpected environments, the FOOD, the art, music and just soaking it all up. Whether you’re our guest for the weekend, new to town, or a life-long resident, if you haven’t tried Columbia Culinary Tours then you’re missing out! So what is a culinary tour? Well I’d say it’s part-dining experience, part-socializing, and part-education. Regardless of how you describe it, it’s a great time and a fun way to sample some of Columbia’s food offerings. You’ll get to sample five to seven restaurants and specialty food stores, and you can also meet the owners and managers of each location. My first tour was the Brunch Tour – a stroll through the district, sampling a variety of tasty breakfastoptions and coffees while learning a bit about Columbia’s history. I walked away with a greater knowledge of Columbia and was happily satisfied from the tasty treats. My second tour was the Flavors Tour, which was a fun tour spent with the accompaniment of good friends. We sampled several restaurants, oils and vinegars from Boone Olive Oil Company opens in a new window, and tasty cocktails while exploring the streets and alleys of our fine city. Have I captured your interest yet? 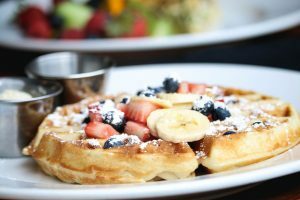 There are five tours opens in a new window to choose from: the Brunch Tour, the Flavors Tour, the Night on the Town Tour, the Night on the Town Tour with wine pairings, and last but not least, the Craft Beer and Food Pairing Tour. These tours are perfect for conference attendees, team-building experiences with co-workers, a group of friends, out of town guests or just for something new to do. We hope you enjoy the experience and make it a part of your Columbia go-to activities. Have fun!